Most rappers would be considered a sell out if they let their song be used by Coke. Not K’naan. “I have a lot of friends who are from either side, Mos Def and those guys who are in the conscious lane. I know other friends who are in the make-money lane. But for me, I see myself as someone who can speak to both audiences,” he said. “That to me is important, to never claim a position too smart for the listener. I think it’s important to reach everybody.” (read the complete CNN article Somali rapper bucks hip-hop code of violence). His interview with CNN as well demonstrates the basic humbleness of the guy. 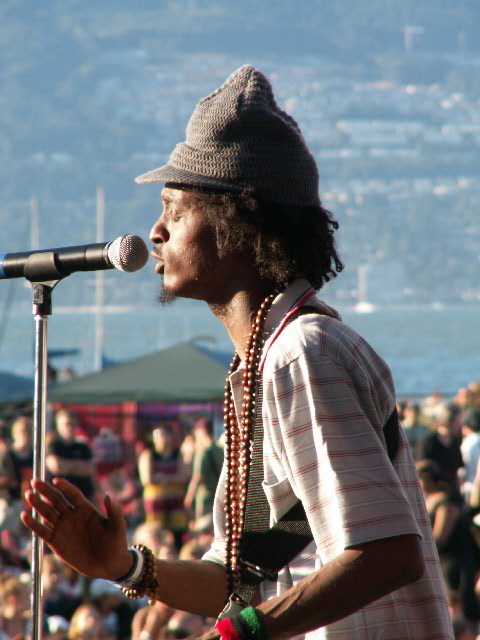 I first got to know of K’naan when i was organizing the youth program for the World Urban Forum in 2006. What I learned was that he was both a principled artist and a pretty good businessman. He never did play at the WUF (unfortunate, as we had a great lineup and over 5000 people attending), but one of the EYAers organizing the WUF, Kevina Power, and a EYAer turned Hip Hop blogger/writer Tara Henley helped out on an amazing concert tour in Joburg and Soweto. (I don’t have many regrets in my life, but not attending this was one of them). I later was able to briefly connect with him at the Vancouver Folk Music Festival (of all places) as part of my volunteer work on the media committee. Again, blown away by the guy and his amazing music and poetry. This is a photo I took of him playing on the mainstage (with the mountains in background … surreal). I love the in your face realism of his message – yes, we are proud; yes, we will move forward to a promised future; but damn the struggle is hard. Funny enough, this verse is not repeated in the official Coke song. I guess Coke isn’t THAT radical. You really have to listen to the song to get the full impact. It is amazing to see that someone from such a background as his can hit it out of the park the way he has. Gives me some hope for the future. ps. for those die-hards, here is Wavin Flag … one more time.